W x L: 20" x 22"
7 Gallon Natural High Density Garbage Can Liners 20" x 22"
Use wherever the can liner will not be subjected to sharp, pointy or rough edges that may puncture the liner. 7 Gallon High Density Natural trash liners 20" x 22" are strong when used properly and handle higher load capacities than similar gauge Linear Low Density (LLDPE) trash liners at generally half the cost. 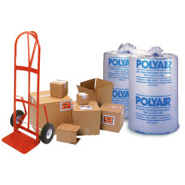 These high density 6 micron 7 Gallon garbage liners take up less space and are more portable due to the coreless roll packaging.